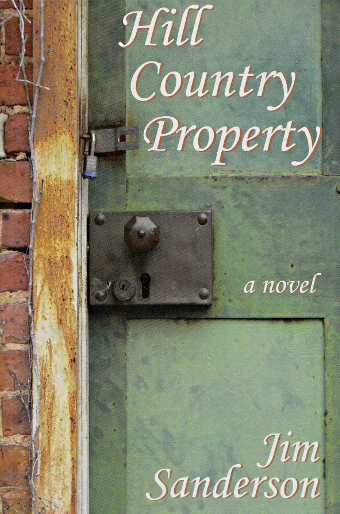 Book Signing: Saturday, September 26th, 2:00-4:00 p.m.
Beaumont author Jim Sanderson joins us with his new novel, Hill Country Property, a prequel to the Beaumont private eye mystery, Nothing To Lose. Before Roger Jackson was a P.I. in Beaumont, he was a washed-out lawyer in Austin. In 1985 he finds himself searching for his ex mother-in-law at the request of Henry, his ex father-in-law, a process which becomes the start of his career as an investigator in the divorce business. Described as a Twentieth Century historical novel, Hill Country Property meanders through a sub-urbanized Texas and the stories of Jackson’s relations to a backdrop of Texas oil fields, horse farms, the Great Depression and the Normandy Invasion. Jim Sanderson has published seven novels, three short story collections, and one essay collection. The short story “Bankers” won the 2012 Texas Institute of Letters’ Kay Cattarulla Award for the best short story about Texas or by a Texas Writer. All of his stories take place in Texas. He teaches fiction writing and American literature at Lamar University, where he now serves as chair of the Department of English and Modern Language. The book signing will be held at the store, 317 23rd Street in Downtown Galveston. Sign up HERE for our email events newsletter. We publish about twice a month, and there's an easy unsubscribe link in every mailing if things don't work out for you.